Most skin tumours in dogs are benign (70-80%) and do not spread, but enlarge over time. The majority in cats (50-65%) are malignant and can spread to other parts of the body. Those that have short fur and light coloured coats who spend a lot of time outdoors are at higher risk of some kinds of skin cancer. To help reduce the risk of skin cancer, at-risk animals should minimise sun exposure, use pet-safe sunscreen or sun-suits. If your pet has new lumps, bumps, scabs or wounds that are not healing, is extremely important to get it checked by a vet early. While there are other causes for skin lumps such as inflammation, infection, foreign matter entering the body or cysts, it may be cancer. The vet will often take a sample and send the cells to a pathologist for examination. There are many options for skin cancer treatment in pets, including surgery, cryotherapy (freezing), radiation, chemotherapy and other medications. While the likely outcome depends on its type, many are curable and have a great chance of recovery. This cat has skin cancer affecting its ears. Image by Dr Brian Husbands. 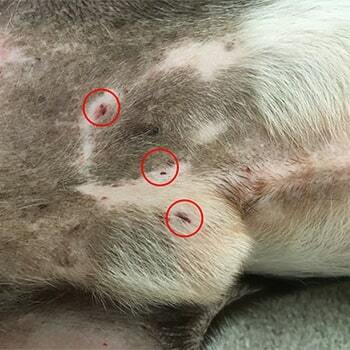 Even small lumps or bumps can be early skin cancer – circles outline several skin cancers on this dogs abdomen.